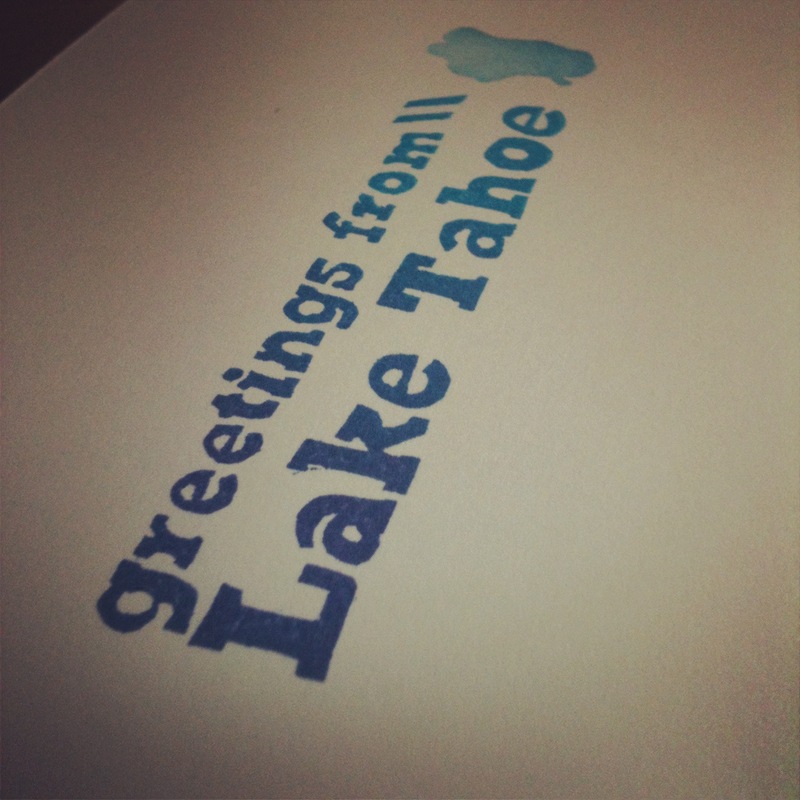 My latest block print design is the outline of Lake Tahoe filled with a Christmas sweater pattern. I drew it all by hand, and carved it on a linoleum block. I printed the green trees separately from a free carve quick-cut on Speedball EasyCut rubber. Due to the detail in the design, this takes much longer to print successfully, but I love the result! 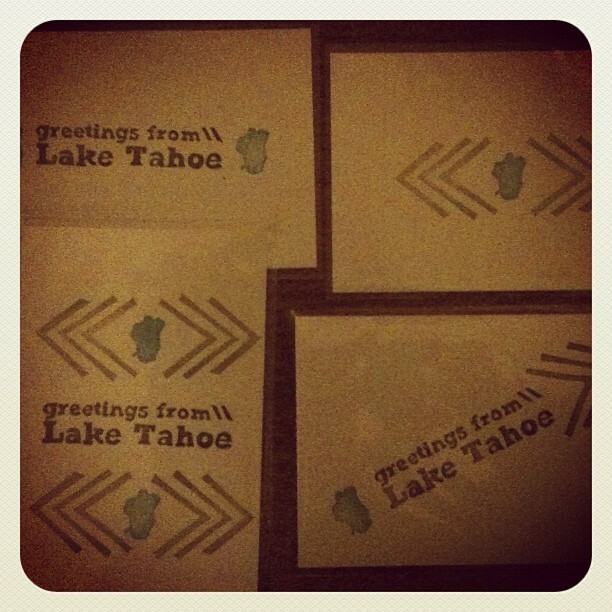 Pick this design up in postcard form at Riverside Studios in downtown Truckee. 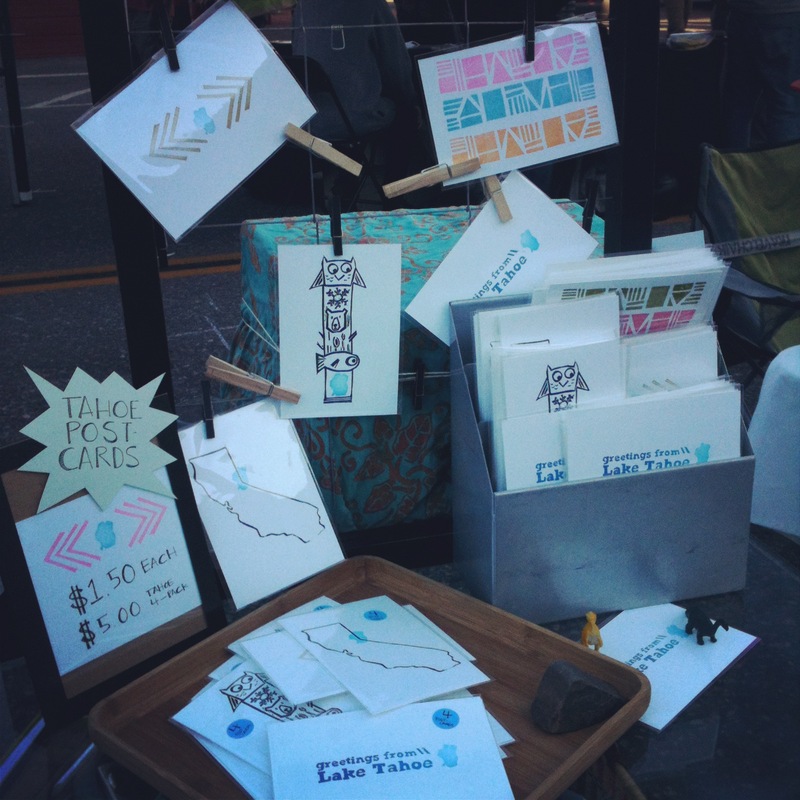 If you missed my big debut at my first postcard-selling booth, here are a few pics from the afternoon. I was at Truckee Thursday in late June, as one of Riverside Studios featured artists. You can buy my postcards at Riverside Studios year-round. a month of letters: 4 days in! It’s been exciting to see the energy and press around Mary Robinette Kowal’s A Month of Letters initiative. As a devoted postcard writer myself (evidenced by my postcard blog) I hold USPS-fueled communication near and dear. A Month of Letters is a challenge for the month of February, to write and send a piece of postal mail every day USPS is open (24 days). And, of course, I’m doing it. *Mail at least one item through the post every day it runs. Write a postcard, a letter, send a picture, or a cutting from a newspaper, or a fabric swatch. *Write back to everyone who writes to you. This can count as one of your mailed items. If you use Twitter, tag your posts with #LetterMo. You can follow my daily mailings at my postcard blog, 28cents. 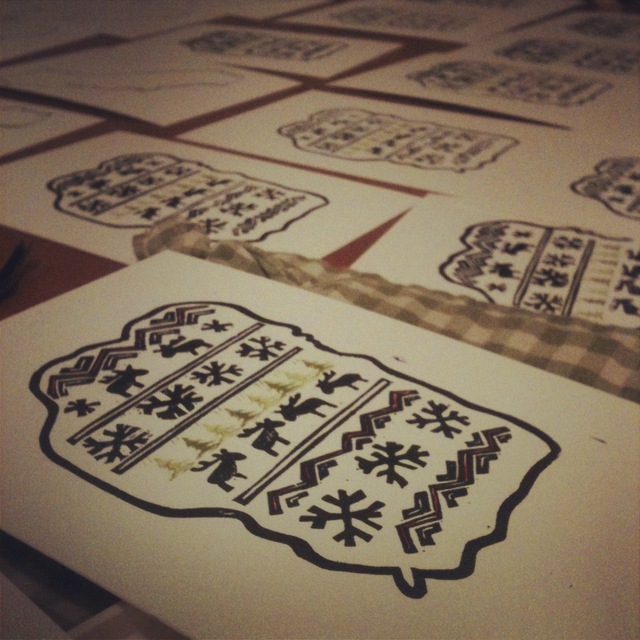 Dropped off some new designs at Riverside Studios yesterday. Which is your favorite? This one’s going into my postcard collection hall of fame. It’s been a happy few weeks in my world. 1) I received a care package from artist Chris Bomely, once very well-known in the Tahoe community for this little guy, who now lives in Austin. We’ve never met, but he found my blog when I applauded his work on the Red Truck a few months back. This seemingly small gesture was HUGE for me. Did I mention I like mail? Especially unexpected packages! 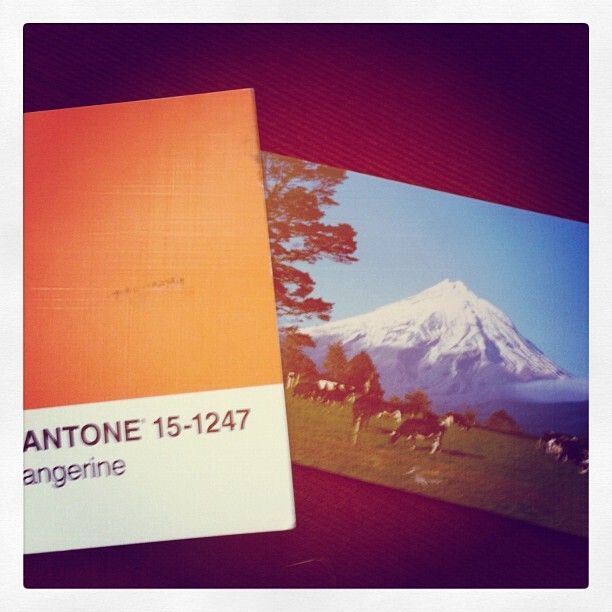 The above card was among the items. 2) My ultimate frisbee team, “Butter,” recently took 6th place at the Northern California Sectionals, advancing to Regionals for the first time in its history — and to the surprise of two teams that were ranked ahead of us going into the tournament. 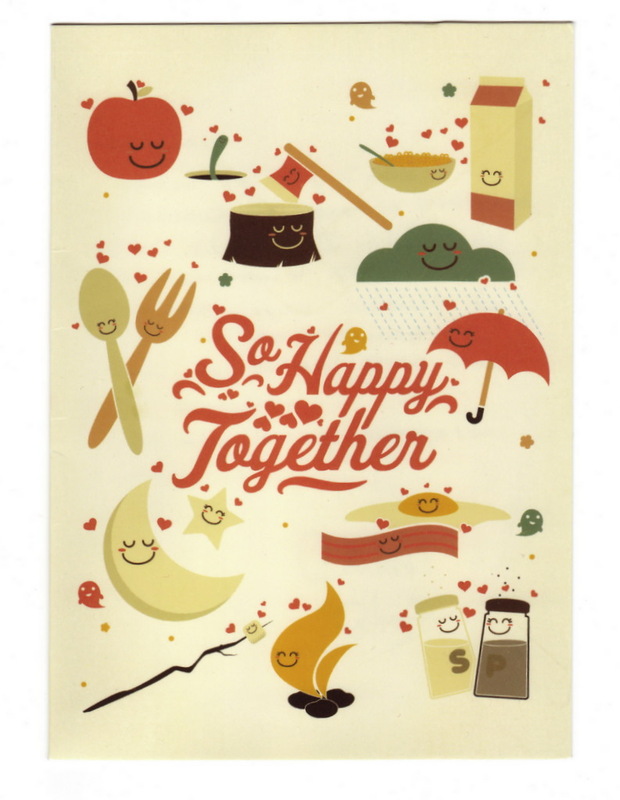 One of our rally cheers is “______ is better with butter,” “______ is better with butter,” “everything’s better with butter!” The theme somewhat matches this card, don’t ya think? Though butter would have many many matches. I just returned from a thoroughly East Coast vacation and, of course, stocked up on loads of postcards. 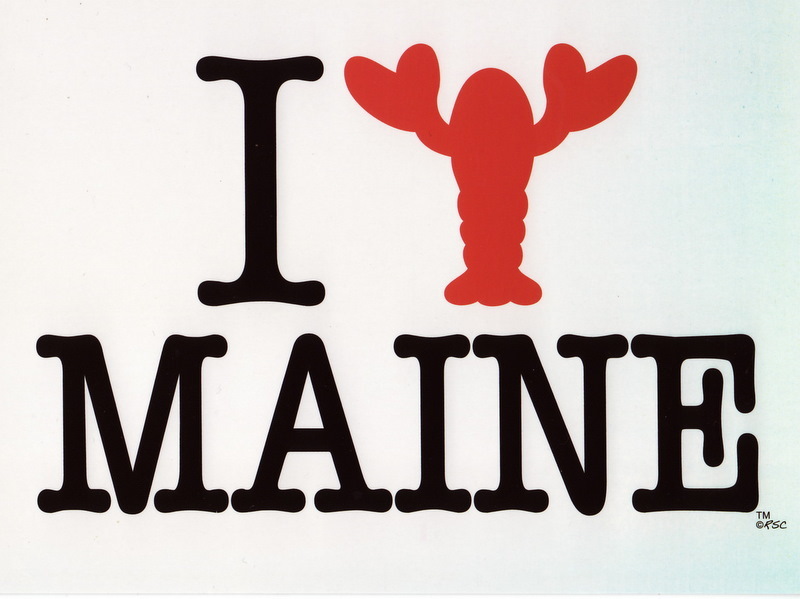 This one was purchased with a lobster hat in Boothbay Harbor, Maine. I ate a whole lobster for the first time, so I got a little out of control with the lobster souvenirs.